Andy Teasdall — who punted twice for 87 yards in the Russell Athletic Bowl win over Oklahoma — met with local media for the first time following Friday’s spring football practice. We caught up with Teasdall after the session, to introduce Clemson fans to the projected successor to Bradley Pinion as the starting punter. Describe your reaction to the news Pinion was turning pro after his junior season. Teasdall: I was ready to see what I could do. There is some hype, some nerves and pressure, but I was ready for it. When I first joined this team, I was happy just being on the team. But I didn’t know if I could play at this level until about halfway through last season. Did any of this affect your preparation for the Russell Athletic Bowl? Teasdall: No, because I didn’t really know (he would be leaving). When we got to Orlando, I cut a family trip short and had to miss Christmas with them. That was pretty tough, but I kept doing what I was doing. I didn’t expect to play, because Oklahoma had such a strong tradition. But when they called my name, I made the most of it. Looking back, was it a blessing in disguise to see action in the game? Teasdall: Absolutely. Missing Christmas with my family was one of the toughest things I’ve had to do. I still consider myself a kid. I had to leave my cousins and their newborn baby. But it gave me momentum and confidence going into the spring. I’ve gained a lot of strength in the offseason. But mentally, it got me ready. 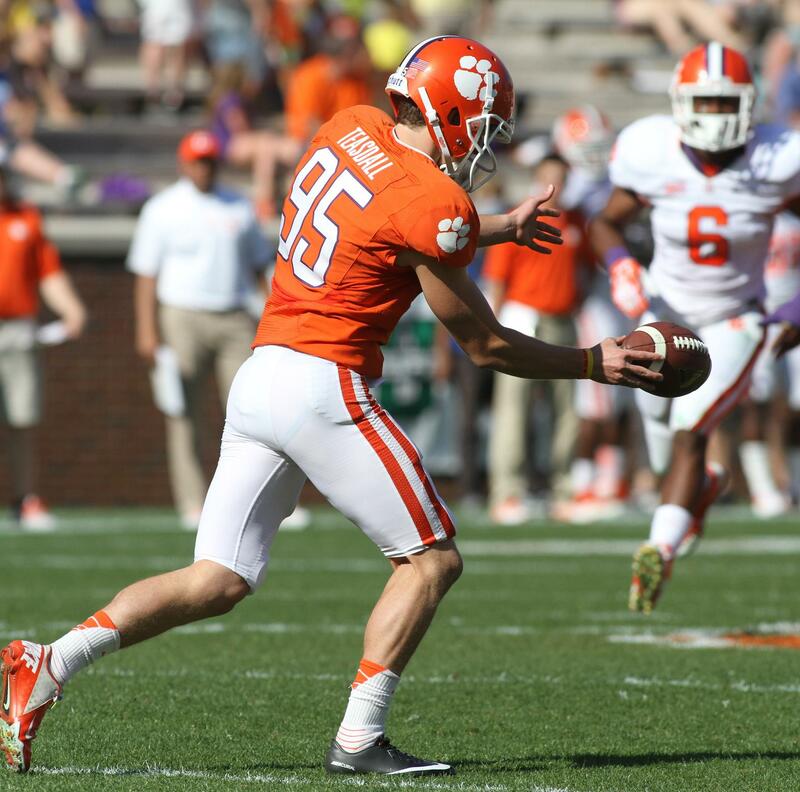 Were you recruited by any schools as a punter? Teasdall: No. I was trying to play lacrosse. My dad played in college. I played football — receiver, safety and punter — but I was much better at lacrosse. I always wanted to go to an ACC school, but only four had lacrosse at the time. So I wasn’t recruited. I visited my brother, who was at Clemson when I was a freshman. I ended up trying out with the mentality that if it worked out, great. If not, I’d still love Clemson. I tried out for receiver and punter. But there were pretty good receivers here, so that didn’t work out. I made it for an extended tryout in the spring of 2013. What are your strengths as a punter? Teasdall: Bradley was 6-foot-6, 230 pounds. I’m 5-11, 185. But I think I’m mentally tough enough to be consistent. I may not hit a high, 60-yard ball like he did every time. But one thing I can take from him was his confidence. He knew he could make every punt a great one. Did anyone on the team in particular take you under his wing? Teasdall: Absolutely, Corbin Jenkins. He’s our holder. He shepherded me through the walk-on tryout. He really took me under his wing, and I really appreciate that. When you’re not punting, what are your interests? Teasdall: Just hanging out, watching sports. I’m a huge March Madness fan; that’s what I’ll be doing tonight. Nothing too crazy. What are your plans academically? Teasdall: I’m majoring in marketing and I’ll be graduating next May. Originally I thought I’d do something in sports, but I’ve figured out there’s more to it than just that aspect of marketing. We’ll see.